Cynthia Barnett is an environmental journalist who has covered water and climate stories worldwide, from the decline in Florida’s signature springs, to epic drought in California and Australia, to the rainiest place on Earth in Cherrapunji, India. She is the author of three books on water, including her latest Rain: A Natural and Cultural History, longlisted for the National Book Award, a finalist for the PEN/E.O. Wilson Award for Literary Science Writing, and named among the best nonfiction books of 2015 by NPR’s Science Friday, the Boston Globe, the Tampa Bay Times, the Miami Herald and others. Barnett also publishes stories and columns in National Geographic, the New York Times, Los Angeles Times, the Wall Street Journal, the Atlantic, Discover magazine, Salon, Politico, The Huffington Post, Orion, Ensia, and others. 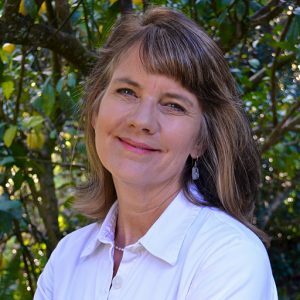 As CJC’s Environmental Journalist in Residence, she teaches Environmental Journalism and Nature & Adventure Journalism and helps team up across disciplines with UF faculty and students who are working to improve public understanding of complex environmental issues such as climate change. Barnett’s first book, Mirage: Florida and the Vanishing Water of the Eastern U.S., won the gold medal for best nonfiction in the Florida Book Awards and was named by the Tampa Bay Times as one of the top 10 books that every Floridian should read. Her second book, Blue Revolution: Unmaking America’s Water Crisis was a Boston Globe top 10 science book of 2011. Before she took the leap of faith to quit her day job to work full-time on the environment and her books, Barnett was a newspaper and magazine reporter for twenty-five years, more than half as senior writer for Florida Trend magazine. Her numerous journalism awards include a national Sigma Delta Chi prize for investigative magazine reporting and eight Green Eyeshades, which recognize outstanding journalism in 11 southeastern states. Barnett earned her bachelor’s degree in journalism and a master’s in environmental history from the University of Florida. She spent a year studying water as a Knight-Wallace Fellow at the University of Michigan.